My friend Reed and I were having a seasonal conversation about social media. Every year we go round the sun, both trying to find a place where we see social media as less harmful than both of us think it is. It’s an ongoing tension for both of us in our business lives, that we are captive to a cycle of content creation and engagement that is a useful tool for all the things we all promote social media to be great for, but useful tools can also be harmful, as anyone who has been stabbed by a carving knife will attest. 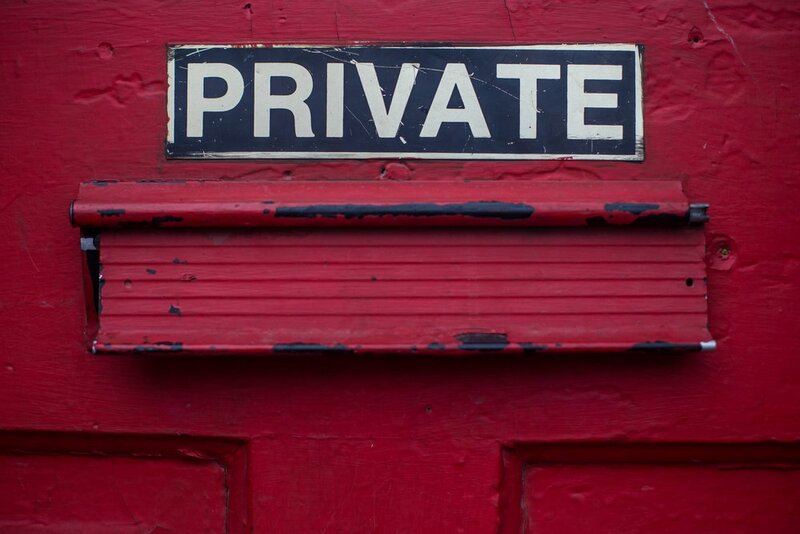 In our seasonal conversation, (winter edition) Reed used the phrase ‘private life’. It really struck me, like it was something that no one ever said anymore, a throwback to a time of landlines and spatial delineation of place, work and leisure. Perhaps because for many people, there is no private life, only public life – public life at home, public life at work, public life on holiday, you get it. Everything is public. Including the most mundane and non-public moments, all of which get shared into the social media feeds, more grist for a mill with a 24 hour beginningless endless cycle. Cameras are everywhere, data is everywhere, and all those images and data points are written in indelible ink in server racks around the globe. Our bodies of information are public property, and I say that without a trace of paranoia, it’s a fact, and one I, like many others willingly contribute to. But again, this data exists historically without context. It can be hacked and reused in ways that won’t represent the intention with which it was created, and can never be adequately explained once it is repurposed. That is the legacy of the traffic of information without borders, it’s a wicked problem and for every part that gets iterated, a new issue will emerge. For Reed and my social media dilemmas, discussions often take the same track – should we do less on social media or should we do more and use our contributions to have meaning? By being part of it, we are complicit, but not being part of it doesn’t necessarily solve the problem either, and here we are again, in the fork of our concerns. The problem with social media is that it is a chimera of people’s actual lives. While it claims to be the real, it is subtly unreal. Yes, they are people, place and space that exist, but what is captured is a moment in time without macro context. As a spectator we can never know the bigger picture, so we project our own experiences onto what we see, and in doing so make continual comparison with our life and others, our lack and their gain. We fill in the missing information with our own stories, completely unconsciously, then compare again, with ever more elaborate scripts and plot turns. The images are curated across all channels, groomed and framed to be the aperture we want people to gaze through. The images are selective, and even when a #fail or a #heartfelt moment is shared, it is still mediated through a screen, and the responses are still a virtue signalling of public support, leaving a large, empty space between the actual pain and shame experience of the poster. The other problems of social media across all channels is it builds a near unbreakable attachment to external reinforcement. We aren’t looking within to work through our stuff, to become still and quiet and connect with our true natures of selves, we are looking outside through a vicarious lens to connect with others who approve of our historical fictional representation. It’s a public performance and the hearts and followers are the breadcrumbs to follow that our lives are ok. Even when they are not, they just look ok with that filter. I think the thing that most struck me about the idea of having a private life was there was only one truly private place, and that was our inner dialogue. It was the one internal moment that could never be shared, and existed only within our minds. A bitter and sweet epiphany given my previous comment about the lack of time and attention most of us pay to this part of our selves. While that inner voice is of course an amalgam of our collective experience and has negative and destructive notes as well as loving and kind ones, through consistent practice of meditation, mindfulness, yoga, observation, vulnerability and compassion, the detritus can be quietened, leaving a diamond strong resource as a moral compass and place for confirmation of ideas and feels. Our efforts should be here and present, rather than on constantly feeding our feeds with the past and opening the doors to the peanut gallery for triggering commentary. But that doesn’t get any accolades, or instant gratifications, it is an interior process that takes a lifetime of work of coming back to being. Ironically however, unlike all the things that cause us pain, suffering and anxiety, our mind is one thing which is totally under our control. When we begin to be master not servant to it, then we can get glimpses of how utterly powerful we are. That we are completely self-contained units, and when we are steady, and present, and stay the course of our investigation of self, we have zero need for external validation. What to do? If the rollercoaster never stops, how do you get off it? And should we get off? Being on a 24/7 roller coaster is tiring, asking next levels of engagement and pre-emptive striking to ensure that all comments go monitored, all opportunities are taken. The hypervigilance of your social profile is creating generational shifts in our brains that we are only just starting to see the damage from. But technology and evolution is a part of life, and a constant that each generation has always had to adapt to, albeit more slowly than the current pace of change and uncertainty. The Buddha was writing about suffering 4000 years ago, as was Patanjali in the yoga sutras. Being human has a history of its own cyclical issues, and social media use is just one in a long line. The constant answer is to turn in, to relinquish attachment to the external view, to know and like ourselves, and see the rest as a symptom of individual and collective pain that can be approached with compassion rather than caution. So I guess we will both carry on posting about our work, and our own practices and processes, and try to be thoughtful of the impacts of our brands, and use right body, speech and mind as our filter of choice.